It’s rare that a country bursts onto the tourism scene with quite as much vigor as Myanmar. After decades of isolation, it’s Asia’s newest hot spot, offering richly layered history, spectacular natural beauty and the edginess that comes with a country still in transition. Since the ruling military junta began to loosen its grip on the government in November2010 signs, of progress – like Opposition leader Daw Aung San Suu Kyi winning a seat in Parliament and the release of some political prisoners earlier this year- have lad Western nations to consider dropping long-held economic sanctions. But a visit to the country, also known as Burma, can be a bit tricky. Here, then, is a cheat sheet for a visit. Although it is possible to get a visa on arrival, travel agents recommend having one in hand before your trip begins. Arrangements take up to three weeks and can be made via travel agents or directly through the Myanmar Embassy. Most tourists visit during the dry season, from November to February. Vaccinations are not required, but Myanmar travels experts like Eric Kareus, the Asia destination manager at Asia Transpacific Journeys, recommended making sure your tetanus, typhoid and polio shots are up-to-date, and getting a hepatitis A vaccination. He added that travelers to remote areas, especially during the summer monsoon season, should consider prophylactic malarial medication. Since Myanmar’s economy is still cash based, plan to pack enough crisp, new dollars (accepted almost everywhere) for expenses, or settle lodging and flights in advance through a travel agent. Although Myanmar’s biggest city, Yangon, is served from most major Asian hubs, the shortest and most convenient connections are from Bangkok. Depending on the seasons, up to eight flights a day- including service by Air Asia, a regional low-cost carrier- makes the 90 minute trip. Well maintained regional jets link major cities with in the country. Accommodations generally provide excellent value (especially compared with neighboring Thailand) and range from smallish luxury properties in Yangon to friendly family run hotels and tropical boutique resorts in other key areas. Thanks to the British colonial legacy, English is widely spoken in the Major tourist areas. Karen MacRae, a senior destination expert at Kensington Tours, said Mynmar is safe for families and described it as “a whole country fill of gentle people”. However, rebel groups continue to be active in northern regions of the country, so tourists should stick to the south and central areas. But crime statistics are low- the State Department Web site specifically Ms. MacRae, who lived in Myanmar for tow years, recommended lighter dishes like laphet, a picked tea-leaf salad, and mohinga, a fish broth- based noodle soup “asking to Vietnamese pho” and best eaten she said, at a Yangon street stall. 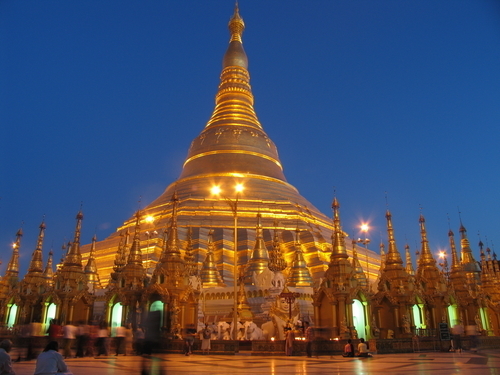 The classic Myanmar itinery begins in Yangon, where visitors will want to spend at least a day visiting the Shwedagon Pagoda- a towering stupa covered in pure gold- wandering among the colonial-era buildings downtown and bargaining for local crafts at the covered Scott Market. Bagan, a dusty region 200 miles north of Yangon along the Irrawaddy River, is studded with thousands of bell shaped stupas, brick temples and castle like stricture that date from the eleventh to the thirteenth centuries. Bagan can be reached form Yangon by air or via comfortable cruise boats that ply the Irrawaddy River to and from Monday, in the central area of the country. Both Lake Inle, in ethnically diverse Shan State, and Ngapali Beach, along the country’s western Bay of Bengal shoreline, are good places for low key R&R, with new resorts opening regularly. Emerging destinations include the pristine Mergui Archipelago in the southeast, great for snorkeling and Mrauk-U, a 15th century royal capital in the southwestern state of Rakhine.